Students in Joel Abels’ drama class at Clovis North took part in a special activity Thursday morning. 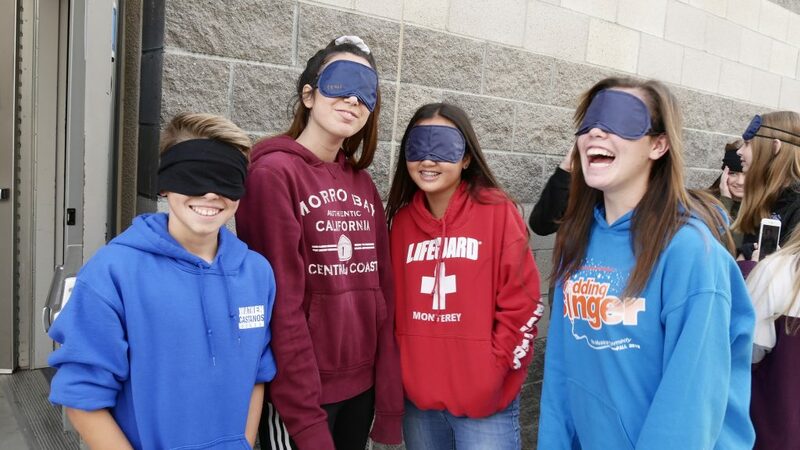 As part of a project titled “Savory for the Senses,” the 40-plus students ate lunch blindfolded to better understand visually impaired classmate Heaven Vallejos and what she goes through every day. To get things started, students lined up outside the drama classroom where they were each handed blindfolds. With the help of leadership students, they were escorted inside the building one at a time and seated at one of multiple tables. After everyone was seated, they were free to eat – or attempt to eat – their lasagna, salad and bread. Most students struggled to feed themselves while other got the hang after a while. After the meal, students had the opportunity to share their experience and reflect on what they learned. Peterson added that he now has a better perspective on what Vallejos, and others who are visually impaired, face. For Vallejos, she hopes her classmates learned a lot after walking a mile in her shoes.